Summon: +0/+2 and Guard if the top card of your deck is . 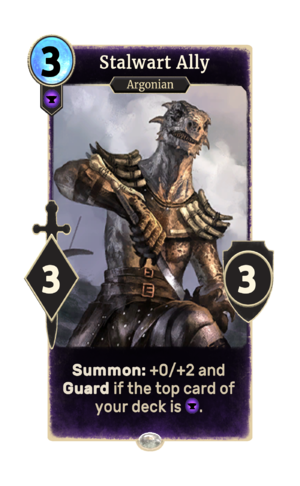 Stalwart Ally is a common Endurance creature card. It is part of the Core Set. "I raise the spine of obedience." "I will be your shell, and keep you safe." This card's summon ability applies the Alliance card effect. This page was last modified on 15 February 2019, at 19:06.